Ensuring a healthy-looking complexion, erasing the signs of fatigue and correcting imperfections, face make-up is an essential ingredient for enhancing the facial features. This is why there is such a wide variety of make-up products on offer, ranging from foundation to loose powder through to liquid blush. How can I achieve a flawless complexion? 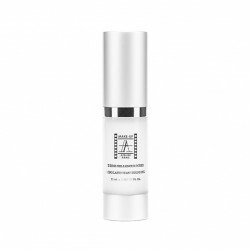 We’re all looking to achieve a glowing complexion, from the moment we wake up and all year round! With good make-up and professional advice, this dream can become a reality. First and foremost, you must ensure you look after your face by using a good moisturising base: make-up only enhances skin that is properly hydrated. Then, define the texture that is suitable for your skin type. 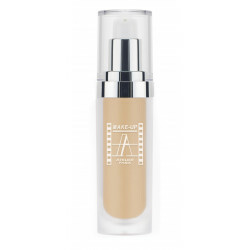 Liquid foundation is suitable for dry skin, while compact mineral foundation is suitable for oilier skin types. For a precise and even application, select a premium make-up sponge; then for an optimum application, distribute the foundation with a brush to achieve a more natural-looking finish. With Make-up Atelier Paris, you have a whole range of tools at your fingertips for enhancing your facial features. Start by distributing the foundation over your skin to even out your skin tone. Next, apply concealer by applying little dabs to erase any signs of fatigue. Then highlight the complexion on the strategic points of the face: cheeks, tip of the nose, forehead, brow and Cupid’s bow. Set with a compact powder and finish off with a touch of blush, or blusher, for a guaranteed healthy-looking glow. Professional make-up artists encourage us to respect the first step in creating flawless face make-up: looking after your skin. Make-up Atelier Paris has perfected a range of moisturising bases that respect the specific characteristics of each skin type and ensure effective protection: a cleansing gel for oily skin types, moisturising bases for combination, dry or oily skin types, a T Zone gel, and so on. Carefully select your make-up base to maintain your skin and ensure the best finish for your make-up. The choice of foundation is equally important: finding the foundation that matches your skin tone is an absolute must! This is what sets Make-up Atelier Paris apart from ordinary make-up brands: we have been made popular by professional make-up artists due to the diversity our foundations, which are capable of adapting to all skin colours. 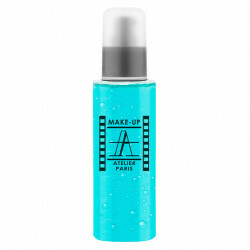 Make-up Atelier Paris foundations are also resistant to water, tears and perspiration, offering you a professional finish. Their long-lasting hold and optimum coverage also make them a stand out product. Blush, concealer and powder for professional-looking make-up! Once your foundation has been carefully applied, emphasise your face make-up with silky or iridescent highlights. Loose powder is essential for setting the foundation and obtaining a natural-looking finish. For contouring, Make-up Atelier Paris offers different tones of highlighter. A high-coverage concealer can help you to cover up a tattoo or scar, which is a technique frequently used by professional make-up artists. For everyday make-up, a radiance-enhancing concealer is ideal for creating a glowing complexion. Finally, Make-up Atelier Paris has perfected a liquid blush, which can be applied with a large brush. Try it and compare it with traditional powder blush! Moisturizing lotion formulated with floral water, glycerin and sorbitol, enriched with a moisturizing complex that restores the skin hydrolipidic film.